Augmented Analytics Is the Future of Data and Analytics. Learn about how augmented analytics, an approach that automates insights using machine learning and natural-language generation, marks the next wave of disruption in the data and analytics market. Data and analytics leaders should plan to adopt augmented analytics as platform capabilities mature. This graphic was published by Gartner Inc. as part of a larger research document and should be evaluated in the context of the entire document. The Gartner document is available upon request from Salesforce.com. Gartner does not endorse any vendor, product or service depicted in its research publications, and does not advise technology users to select only those vendors with the highest ratings. Gartner research publications consist of the options of Gartner’s research organization and should not be construed as statements of fact. Gartner disclaims all warranties, expressed or implied, with respect to this research, including any warranties of merchantability or fitness for a particular purpose. Sign up and get our complimentary report now. Gartner’s much-anticipated Magic Quadrant represents some of the most important market research on technology. 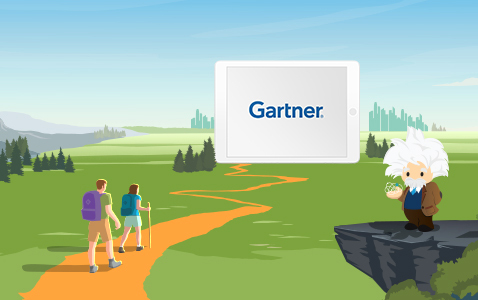 See what Gartner thinks of Salesforce Einstein Analytics and Einstein Discovery — download the Gartner Magic Quadrant now.